Athletically, Penn High School has established itself as a perennial power in the state of Indiana. Last year, the Kingsmen had an 82.7 winning percentage. Penn teams earned 16 sectional championships in 19 IHSAA Championship Tournaments. The Kingsmen hoisted a Regional Championship trophy in 9 sports. Penn won 2 Semi-State Championships. Penn teams combined to win 15 of 19 NIC Championships. Penn was the only school in the state to win a Sectional Championship in every Fall sport. Penn was the only school in the state to win a Sectional Championship in every Spring sport. Under the direction of our head coaches, this year promises to be just as successful and we need your help to make that happen. Your support is necessary for our continued success because in Indiana (except for facilities, some travel and coaching salaries), the Athletic Programs are NOT supported by tax dollars. ALL equipment, supplies, and other accessories associated with any of our athletic teams must come from gate receipts (ticket/sport pass sales), fundraisers, and donations. I hope you can see your way to help support our student-athletes with the purchase of an “All-Sports” or “Season” Pass. In return, we will supply you with a reserved seat at home football and basketball (boys and girls) games or you may choose to sit wherever you would like. If you purchase an Adult All-Sports Pass, you will get one parking pass per family to use at home football games. This allows you to “not pay to park.” It does not allow you special parking in the back lot. The overall savings through the purchase of one of our passes is significant as you can see by the price page, as well as listed below! To register online, please use the following link: Penn All-Sports Pass Registration. You may also print off a blank copy of the form from the attachment posted here. You can drop it off or mail to the Athletic Office. If you are mailing your form, you will need to include a self addressed stamped envelope. Please keep in mind how many passes you are ordering and make sure you put enough postage on your return envelope. If you do not include a self addressed stamped envelope your sport passes will not be mailed back to you. You will be able to pick them up in the Athletic Office beginning Friday, Aug. 3, from 8 a.m. - 3:30 p.m. If you pay for your passes online, they will also be available for you to pick up beginning Friday, Aug. 3. They will not be mailed to you so you will need to come to the Athletic Office to pick them up. 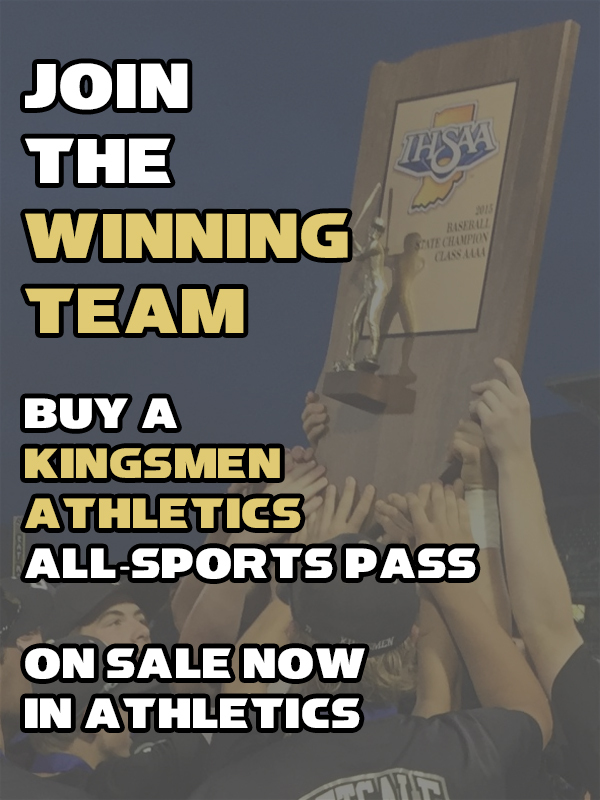 Thank you for the support of our Kingsmen as they continue the Tradition of Excellence! Three teams continue their state championship quests!